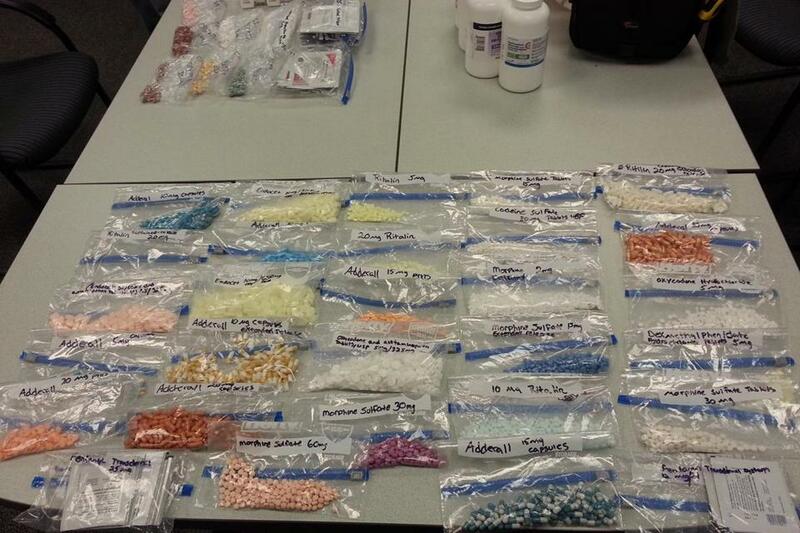 A sampling of the 18,000 prescription pills stolen from a Hyannis pharmacy last year. WASHINGTON — In just one Cape Cod community, the price of opiate addiction seems to be everywhere. A father and son steal 18,000 pills from a pharmacy, breaking in during a snowstorm. A grandfather discovers his 22-year-old grandson passed out with a syringe in his arm containing painkiller tablets that he had cooked down to inject. The deputy police chief’s own nephew becomes addicted to oxycodone at 18, after back surgery. For Detective Sergeant Charles Peterson of the Yarmouth Police Department, one of the most frustrating aspects of prescription opiate abuse is that so much of the epidemic could be prevented. The pharmaceutical industry has developed pills that are strongly resistant to being crushed — and are therefore difficult for addicts to abuse. But industry profit margins, battles over patents, caution over a still-emerging technology, and a ponderous federal bureaucracy have kept such abuse-resistant pills from widespread adoption in the market. Peterson, a 20-year veteran of narcotics enforcement, is among the supporters of proposals in Congress to require that drug companies market only abuse-resistant versions of oxycodone and other prescription opiate pain-relief pills. Advocates say the need to curb abuse of prescription opiates — considered gateway drugs to heroin — is all the more urgent because of a growing epidemic of heroin addiction and overdoses in Massachusetts and across the country. Currently the federal Food and Drug Administration allows one painkiller — an expensive reformulation of the brand-name OxyContin — to be marketed as abuse-resistant. Meanwhile, other opiate medications, ubiquitous on pharmacy shelves and widely prescribed, are easily pounded into powder for snorting or dissolved for injection. Drug companies that make the cheaper generic forms of oxycodone and other painkillers are resisting the proposed changes in Washington. Critics say the industry needs to be forced to comply. “They’re not going to go anywhere that would affect their bottom line unless they get pushed that way,” said Representative William Keating of Bourne, prime sponsor of the House bill — Stop the Tampering of Prescription Pills Act — that advocates hope will get a hearing this spring. The majority of the state’s all-Democratic delegation in Congress has signed onto the bill, along with key Republican Hal Rogers of Kentucky, who all have seen prescription narcotic abuse devastate their communities. Keating and others also are highly critical of what they consider a slow response by the FDA. The agency last year issued a draft of voluntary guidelines encouraging the development of painkiller pills that would curb abuse. But it has not addressed how the new formulations would apply to generic drugs, which dominate the market. The take-it-slow approach falls far short of the aggressive mandate sought by advocates. “While all this is occurring, people are dying, lives are being ruined, and families are being torn apart,” said Keating, a former district attorney who witnessed the addiction crisis at first hand. The debate is complicated by the rules around drug patents. Generic manufacturers win access to markets once the patent on a brand-name drug expires. Typically, that is a positive thing for consumers because it dramatically lowers the costs of prescription drugs. But in the case of addictive substances, say advocates of the bill, cheaper generics have the potential to cause more harm than good. The stakes of the debate are high for drug manufacturers: generics represent 82 percent of the $8 billion US market in prescription opiate medications. Abuse-resistant formulations make up less than 3 percent of the market. The thrust of industry objections is that it’s premature to mandate antiabuse measures because the science is still evolving. Manufacturing techniques used to render one type of opiate drug resistant to crushing, for instance, may not work on other, similar drugs, because of variation in molecular composition. Executives at the Generic Pharmaceutical Association, the industry’s trade and lobbying group in Washington, declined interview requests. In a letter to the FDA last March, the association argued that crush-resistant technology had not been proven to deter abuse, so the agency should not allow the brand-name drug companies to use such technology as a way to gain exclusive market advantage. Limiting access to affordable generics would result in higher health care costs and no corresponding public policy benefit, according to the association, which spent $2.2 million last year lobbying on various issues, including on abuse-resistant painkillers. President Obama could issue broad guidance, saying he would like the FDA to improve consumer protections, but he would not be able to define the specific steps needed to change the drug-approval process through an executive order, said John Hudak, a Brookings Institution fellow in governance studies and an authority on presidential powers. That discretion would be up to the regulatory agency. In the meantime, the FDA remains on a cautious footing. It is in the midst of devising voluntary guidelines for generic drug companies to develop abuse-resistant drugs, said Dr. Douglas Throckmorton, deputy director for regulatory programs in the agency’s Center for Drug Evaluation and Research. The FDA rewarded the manufacturer of OxyContin, Purdue Pharma LP, in April 2013 when, for the first time, it permitted a company to advertise a crush-resistant formulation as being less prone to abuse. The decision occurred on the same day Purdue’s patent for the original OxyContin formula expired, and blocked generic companies from copying it. Critics accused Purdue of gaming the patent system and endangering the public in trying to block competition by not introducing the crush-resistant version until its original patent neared expiration. Purdue in 2007 was found criminally liable for downplaying the risk of addiction to OxyContin. A Purdue spokesman said the company has spent more than a decade investigating ways to make OxyContin harder to abuse. Now, Purdue and other pharmaceutical companies that create branded drugs have formed an alliance supporting Keating’s legislation. They contend they need congressional help to protect their market share from generics without the safeguards. Shortly after granting Purdue the ability to promote the abuse-resistant version of OxyContin, the FDA made a series of decisions that confounded law enforcement officials and lawmakers. The agency refused to permit the manufacturer of another drug, Opana, to make abuse-resistant claims for its crush-resistant formulation, saying its technology was not effective enough. The ruling means generic versions of the original, crushable Opana continue to be sold. In October, the agency set aside a recommendation from its own advisory panel and approved Zohydro, a high-dose narcotic painkiller and the purest form of hydrocodone available — with no abuse-resistance features. Dozens of state attorney generals, including Martha Coakley of Massachusetts, wrote to the FDA urging that it reconsider the decision. The agency said the benefits of the drug for patients in severe pain while suffering from diseases such as cancer outweighed the risks. Patrick Cronin, a program coordinator for Massachusetts Organization for Addiction Recovery, said he got his first OxyContin high the night he graduated from Suffolk University. It wasn’t long before he and his friends descended into heroin addiction. He fears that other young people will go down a similar path abusing the new Zohydro and generic opiates.